The exploitation of the golf ball effect promises further aerodynamic optimisation of race cars if the improvement in air resistance does not significantly affect downforce. Investigations – in the wind tunnel and (as a verification) also by CFD calculations – have been carried out on a Formula 3 rear wing with different dimple setups on the main wing and the flap, such as dimples in the front end, in the middle and in the rear end or all over both main wing and flap. Many different combinations have been analysed with different angles of attack. The basis for comparison was a standard, smooth rear wing with standard, smooth flap. Furthermore, slight side inclination to simulate crosswinds has been looked at. The results show that different combinations of dimple setups in main wing and flap allow for improvements in aerodynamic efficiency over the standard wing only for specific angles of attack, and there is not ‘the’ optimal combination for all use cases. Modern race cars have large numbers of sensors monitoring car vital signs and vehicle dynamics parameters. Analysing large amounts of sensor data requires strategies that enable the data engineer to quickly check all the vital parameters and identify trends showing the evolution of the vehicle health. On a secondary level, there is also the need to understand if changes of weather or vehicle detail are influencing vehicle health. From a vehicle development point of view, it is interesting to see the performance evolution, the factors that influenced the evolution and also the effect of certain changes on different aspects of performance. Using KPIs will show, in time, where the performance window has to be, where the driver/drivers feel confident with the car and if any setup change is bringing the performance indicators towards a desired range. Using this kind of information will help engineers decide where exactly to look in more detail at the data. Laptop computers allow everyone access to expert software packages such as laptime simulation packages, data acquisition software and CAD. However, this doesn’t necessarily make the user an expert in vehicle dynamics and mechanical engineering. The computer ought to be a tool to assist the engineer in decision making. The computer is infinitely faster than the human brain, and through this speed it gives the expert better usage of his/her expert knowledge and know-how. But (until now) it doesn’t replace the expert knowledge. This presentation will provide a series of examples of how computers can mislead engineers. But if engineers possess enough expert knowledge and know-how, they will be able to recognise, understand and correct errors. Simulation enables users to gain a proper understanding of their vehicles and how the different parts influence performance. This is valid as long as the model has a good correlation with the reality. In this presentation we will demonstrate how you can build such a model based on on-car recorded data, using our freely available LapSim software. After the workshop you should be able to perform the same exercise for your own vehicle. We will also outline the underlying simplifications of the model and the limitations of the simulation model this causes. After the LapSim workshop/presentation you will know: how to create a setup file of your vehicle, how to analyse the complex behaviour of a vehicle, how different parts could influence the performance of a race car, how to build up a simulation model based on on-car recorded data. Since 2015 a special licence has been needed to be allowed to race on the Nordschleife. The idea behind all this is simple: before the permit was invented, everyone with a big enough budget could race on the Nordschleife in every possible car, even GT3 race cars. Many accidents happened, because gentlemen drivers in GT3 cars had no idea what they were doing and were unable to foresee the speed and racing lines of slower cars. Nowadays everyone who is new to racing on the Nordschleife has to pass a training programme – including an e-learning programme – to be allowed to take part in VLN races. After passing the training and the e-learning, these new drivers are only allowed to race in small cars until they gain enough experience to race in big cars as well. Even pro drivers such as Earl Bamber, Andre Lotterer and Jamie Green had to undergo this procedure. Kelvin van der Linde achieved his Nordschleife permit Grade A at the end of the 2015 season and won the 24h race in 2017. A story of success! The presentation will discuss road sports vehicles and customer racing suspension adjustment, including important tips and notes on the settings – especially for suspension – for road sports and customer racing cars on racetracks (Nordschleife, Circuit Spa). An afternoon with Thyssenkrupp Bilstein discussing setup and taking a detailed look at patch load variations. The session will begin with the four theoretically simple methods by which lap times can be improved: 1. Maximising the grip during cornering, acceleration and braking by three actions: I.	Maximising the tyre friction coefficient; II. Adding aerodynamic forces to the wheel loads; III. Minimising patch load variations; 2. Maximising our middle power output by maximising horsepower over the whole rpm range; 3. Minimising the weight and lowering the centre of gravity; 4. Minimising the aerodynamic drag. This will be followed by a detailed discussion of patch load variations, with experts from Bilstein on hand to help answer questions. This workshop will discuss the most important tuning tools and useful performance indicators. The influence of tyres will be explained with the help of the handling curve. Furthermore, additional effects of wheel-load transfer, tractive forces and compliances will be explained. Using the Milliken Moment method (yaw moment diagram), further key performance indicators will be presented, such as trimmed resp. maximum lateral acceleration, directional stability, available control, available steer, steering sensitivity, yaw stability, etc. The role of simulation will be demonstrated employing aerodynamics. Eventually, the influence of the driver, their driving style and the choice of the driving line leads to the answer to the question. Methods of modern engineering support for suspension customers with their customer cars. Customers often buy cars like a new GT3, GT4 or TCR. To understand the car you have to get deeply into the suspension. Customers need to understand the hardware and the data. KW is able to show what are the first steps hardware-wise on the car and where to find the keypoints in the data and software of the car. To achieve the full performance, a deep change in springs and damping forces needs to be undertaken. That will be judged by seven-post testing and lap data. In times of digitisation, motorsport customers (teams and OEMs) have to battle with a flood of data produced by their cars, organisers and surroundings, which needs to be exploited. Modern motorsport industry partners need to deliver damper systems and also real engineering support in terms of post rig management and data analysis to get the physics right from the start. We will discuss this and give examples of how teams and OEMs can save months of development time and testing costs. This discussion will cover tyre life, and the effect of POG, COP and suspension, including some new thoughts from various motorsport disciplines and simulations in order to understand what makes a tyre hot without destroying it. Around 15-20% of lap time is on brakes. As a key performance factor in racing, each application requires a suitable friction couple in order to maximise braking efficiency. An insight into performance advantages provided by PAGID Racing brake products will be presented, which is the basis of understanding the application-orientated pad compound development approach followed. Additional value-adding factors comprised in the technical service will be highlighted. Two of the primary tools for race-car simulation are driver-in-the-loop and lap-time simulation. Sometimes it can be rather confusing to work out how to employ these tools. Using lessons learned from the field you’ll be shown how to use these tools to maximum effect. A large number of race teams and manufacturers do shake rig analysis and make a big effort to connect it to track results. In most cases it is one step forward, but sometimes the rig results are perceived as being wrong. This happens when a totally different setup shows to be the best in later track testing. Most times it comes out of a lack of insight into what the shake rig provides and its limitations, and how to add the driver-specific needs without messing up the shake rig results. One of the important links to connect rig and track results is driver-vehicle interaction timing. In this workshop we will take a look at what driver-vehicle interaction timing is and what can be learned from it to better transition between shake rig and racetrack. In September 2016 Nico drove his Alzen Motorsport-entered Ford GT to a new lap record in the VLN championship on the famous Nordschleife circuit. In this workshop Nico will show and explain how to drive quickly, consistently and safely on the ever-challenging Green Hell. He will use onboard video followed by a presentation including corner-by-corner analysis, explaining the key facts and cornering tips and tricks. Following the presentation he will hold a Q&A with the audience. On 24 June 2018, Volkswagen's all-electric I.D. R car won the famous Pikes Peak International Hill Climb race, not only breaking the EV record by 60 seconds, but also Sebastian Loeb's Peugeot 208 T16 2013 record by an incredible 15 seconds and the magical eight-minute barrier, a time that many thought would never be achieved. This was followed by an outright win at the 2018 Goodwood Festival of Speed hill climb, smashing the existing electric record time by 3.5 seconds and setting the third-fastest time ever recorded. Integral Powertrain supplied the machines and drives for the car, and breaking with the usual tradition of secrecy surrounding top-end motorsport, this presentation will reveal details about the technology, including the next-generation silicon carbide inverter, and how the motors and inverters were applied to the car. The presentation will discuss the use of CAE tools to better understand the clearance and creepage paths that electricity would like to take, these paths not being conducive to the quality and safety you desire. This will include the use of a software tool to efficiently perform automatic clearance and creepage analyses on CAD data in order to ensure product safety in the early design stage. With the rise of Formula E, and a growing list of other high-performance race cars no longer powered by conventional combustion engines, the science of race transmission design and development is entering a new era. No longer engineered through iterations of proven concepts, backed by decades of race data, this new breed of transmission is redefining efficiency through innovative design and novel architectures. Ricardo has been at the forefront of this journey, developing the technology to produce highly efficient transmissions, resulting in performance differentiators that win races and ultimately championships. Looking back over some of the challenges already overcome, Ricardo will review the demands and solutions of a modern Formula E transmission design. Energy strategy in Formula E is a major performance differentiator for race teams, and getting this right is a great way to start your battle for the podium. However, at warmer races, not only do teams have to contend with the demands of dealing out the limited battery energy supply, but also with battery overheating. In this presentation we will describe how optimal stint-long energy strategies can be produced in simulation and how much time they are worth compared with a less sophisticated approach. The FiA World Rallycross series is one of the most exciting and fastest-growing motorsport series in the world today. It has a loyal following, but recent innovations have broadened its appeal both with fans and with the manufacturers that support the series. The latest innovation is to change the propulsion system of the top ‘Supercar’ category from IC engine to a battery-powered fully electric powertrain from 2020. Building on the incredible success of its Formula E battery, Williams Advanced Engineering has been nominated by the FiA as the sole battery supplier to the eWRX series. Doug will present an insight into the development of the battery and its integration into the chassis in what will be a new and uniquely challenging environment. The Porsche 919 Hybrid Evo is an evolution of the Porsche 919, which accumulated successes in the WEC between 2014 and 2017, including three Le Mans 24h victories and six World Championships. The idea behind the project was to develop the Porsche 919 without limitation of regulations as well as to take advantage of the knowledge and components originally developed for the 2018 version of the LMP1 car. Development areas included optimisation of the aerodynamic package with active drag reduction systems, individual control of brake calliper pressure, as well as mapping the powertrain for optimum one-lap performance. The first FIA Formula E race took place in September 2014. This December will mark the first race of the new Formula E gen2 car. Benjamin will discuss the technical changes during this period, compare Gen 1 and Gen2 and discuss the areas open to manufacturer development. The second part of the presentation will cover the new electric rallycross championship, due to launch in 2021. Benjamin will cover the key points of the technical regulations as well as the opportunities for manufacturer development. The future for transport is all-electric, or so we are led to believe. But there is a real alternative, one that retains over a century of understanding of a tried, tested and highly refined technology – the internal combustion engine – and that is near carbon neutral. “Synthetic fuels can make gasoline- and diesel-powered cars carbon neutral,” Volkmar Denner, CEO, Bosch. Prodrive is creating a racing car that would: demonstrate a future for a decarbonised fuel supply; promote alternatives to carbon-based fuels by using synthetic fuel generated by renewable energy; accelerate the development of these future technologies by subjecting them to the rigours of racing; highlight the potential for shipping, aviation and goods transport, whose needs are unlikely to be met by battery-electric technology for the foreseeable future. Over the past 10 years, Hewland has developed considerable EV transmission design and manufacturing capabilities culminating in the support of the Formula E series from its inauguration. The presentation will discuss the new challenges facing gearbox designers and how advancements in simulation techniques allow transmissions to be optimised for efficiency and weight saving. It will also cover new manufacturing methods and technologies to provide further significant gains in efficiency. Axial flux motors have been used in many applications in motorsport. The presentation will give an overview of different axial flux motor technologies and also compare them with conventional high-performance motors. Given the specific characteristics of the motors, suitability and benefits in different applications will be presented based on examples ranging from Pikes Peak to Formula E. The presentation will then look at the future development of the axial flux motor technology. 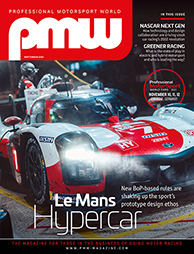 In the drive to reduce weight, cost and complexity in vehicle wiring looms, the latest-generation race cars utilise a modular system architecture. Cosworth Electronics explains how its Central Logger Unit and Synchronous Junction Units deploy EtherCAT communication technology on the latest IC18 IndyCar and Prototype cars to provide high-precision synchronous datalogging and control. 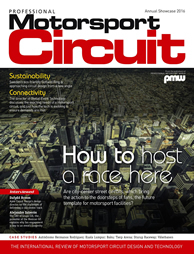 In addition, Cosworth Electronics explains how access can be managed across multiple control units, with several parties involved, to maintain a secure, reliable and fair solution for teams and manufacturers. Performance Projects designs a wide range of vehicles, from autonomous off-highway to top-flight motorsport. The clear, structured processes used ensure an efficient and thorough method of design, proved for suspension systems, recently including Formula 1 and Time Attack. Questions will be welcome at various points during and after the presentation. This presentation will show the development of the Volkswagen I.D. R for Pikes Peak, explaining some of the specifics of the race and the important part played by aerodynamics and use of composites. With 35% thinner air at the high altitudes of Pikes Peak, downforce is a corresponding 35% lower than sea level, compensated for, among other things, by the huge rear wing. The car’s styling needed to fit in with the styles of Volkswagen’s electric cars. Development time was short. Weight plays a key role in hill climbing. Bodywork and wings had to be stiff but extremely light. Technology and processes from F1 and LMP1 such as hollow structures, internal ribs and ultra-thin material were used to minimise weight and meet the challenges of these extreme conditions. Free from regulation, aerodynamics were pushed to the limit. Perfect coordination between aerodynamic development and composite structures knowledge was key to drive the design in a winning direction. Angus will use his experience in F1 and Formula E to explain how data engineering can be used to make a race car faster. He will talk about how all areas of the car can be understood with the use of data and knowledge of the physics involved. This will include powertrain/power delivery/efficiency including fuel consumption; transmission/gearshifting shift timing; tyre pressure/temperature and contact patch management; mechanical and aero optimisation. He will also talk about how data analysis can be used to avoid incorrect calls (which are all too common if drivers are listened to exclusively) and set priorities based on analysis showing what performance benefits can be achieved in each area and used to focus your team and developments more efficiently.